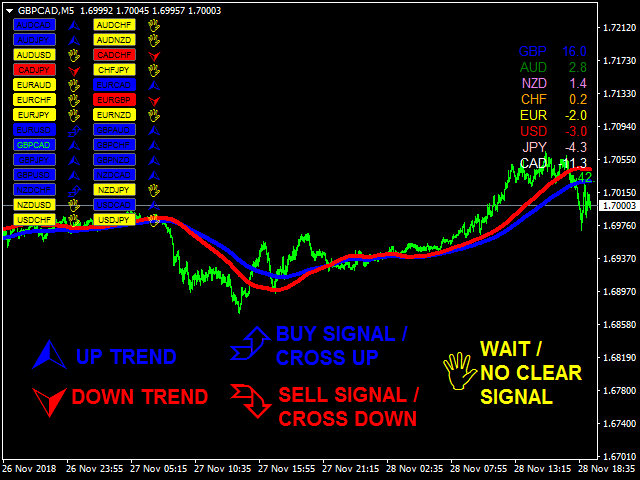 *MOVING AVERAGE LINE - Typical moving average which is based on one chart alone. 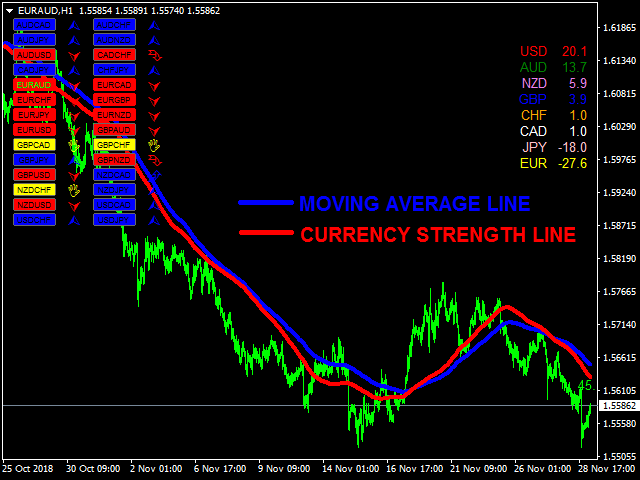 *CURRENCY STRENGTH LINE - The moving average of a certain pair in which the strength is based on 28 pairs. Can be said as the REAL MOVING AVERAGE LINE. Moving Average indeed is one of the most popular indicator which almost every trader use. It can clearly give us where the trend of a pair is going. But the fact still remains that a lot of trader are still having problem making profits by just using MOVING AVERAGE. Now I introduce you the the most advance way of using MOVING AVERAGES with the taste of CURRENCY STRENGTH METER. The "MAIN CONCEPT" of this indicator is getting the base value of 8 currencies and convert to moving average. The typical moving average line of EURUSD pair will just all be based on "EURUSD" chart ALONE. But this indicator will give you the REAL MOVING AVERAGE LINE by calculating the real VALUE of EUR on major pairs and the VALUE of USD on all major pairs. This means that the CURRENCY STRENGTH LINE of EURUSD is not just based on the EURUSD chart alone but on all EUR and USD pairs which will give you the MOVING AVERAGE LINE in terms of its strength on other currencies. This indicator you will show two moving average line. The BLUE line is the normal MOVING AVERAGE LINE which every trader use. While the RED line is the CURRENCY STRENGTH LINE. Currency Line Period - Input PERIOD for Currency Line *NOTE: putting "0" (zero) means you current candle. Example: D1 with 0 period means the strength on current day candle. PIPS_CROSS - The difference between MOVING AVERAGE Line and CURRENCY STRENGTH LINE to tell whether a pair is trending or crossing. Alert based on - Choose between Time Interval based or a Change of Direction based alert. Alert me at - Choose what time you want to get your alert. MAX_CANDLE - This will limit or control the maximum candles to be analyzed. Limiting the number of candles is made to avoid possible lag or hangs on the pc. This will prevent possible slow responses from your MT4 due to high load. Imagine how much calculation the indicator is doing for 2500 candles on 28pairs. The best decision you would ever do is to buy this indicator. Currency Strength line is on whole new different level which enables you to take big trends. I am now averaging 150 pips TP per trade. Excellent job! It’s is a very smart system , and if used correctly with correct money management it can be very profitable , the good trades tend to continue for longer times while the bad trades are exited quickly. So the overall is in the positive. The developer is great , he is always responsive quickly , and he does his best to solve any problem. I whole heartedly recommend this indicator. Full disclosure I am not trading real money yet. But this indicator looks AWESOME in demo and if you get full purchase you get access to the Facebook were people are posting trades and making money. The biggest point from people in the FB group seems like the easy of use and the amount of pips or % they are making ! One person said it correctly that if there ever was a single indicator system this is it! Let me also make this point, and to make a long story short. Emier went way above and out of his way to help me with some technical issues. So you wont get any better service ! Without him I would not be up and running. Let's also not forget the one on one you get with him about the indicator to make you you understand it all. I was already trying to put together a system of currency strength with moving averages but then he came out with this and did the work for me...lol.......Thanks Emir ! This is the best indicator you would ever see on this market. Very easy to use. crossovers have high probability of winning. Just have the discipline to follow crossovers and you will be a successful trader! I have only bought this indicator due to GRATITUDE, CURIOSITY and TRUST. GRATITUDE for this guy helped me to be stable in trading years ago. CURIOSITY for this is another work worth to take. And TRUST on his work. As expected, it didn't disappoint me and I can say this is on another different level of trading. It is a stand alone indicator. A simple cross which always equates to money. Use H1 and H4 for trading. Very good support. Default setup of the indicator is good. I have no facebook to join his group but emir will still explain to you the whole concept of the indicator so you can use it and modify it on your own taste. Within a month i am using it I can say it's pretty stable, some trades can make 150pips within a day. I got some losses too but I am 23% positive this month. No words to express my gratitude. Grazie mille Emir! This is by far the best indicator ever i found online. i trade using it starting last week and i gain +3% on my account. amazing indicator with the power of currency meter matched up with a moving average. no doubt maybe this one is what you're looking for. Very easy to use. watched out only for the crossover then trade and enjoy the rest of your profits. thanks for this indicator it helps ease my trading with confidence. Try it to see it for yourself. you won't regret it. 100% gain in 7 weeks. Very simple but powerful indicator! 100-150pips TP is easy to hit. High Accuracy trading. Very Good for swing traders like me. So I went ahead and bought this indicator, and WOW am I glad I did. First, Emir is beyond helpful not just to those renting it, but he goes above and beyond for those who purchase this. He's even adding a few customizations for me that I want to try out. He does a private lesson on how to actually use the indicator if you purchase. As for the indicator, it makes the market make sense. No more over analyzing. It gives you a heads up of a strong reversal, and it tells you when a market is getting weaker before it gets weaker. I haven't even learned everything there is to learn about the indicator. Definitely the best Mql5 purchase to date. Good support. I Rented for a Year with free one on one discussion thru team viewer. Good indicator with legitimate gains. Superb! Very easy to use and has a lot of ways to make money. +400pips and counting. Holy Grail of FOREX! I just got 3 open trades few days ago. Left it and now I am positive 380 pips! The very first time I got 200 pips in one trade! I will post my trade on the comment section. Now I got the full license of this indicator. This guy deserve 5-star! No words to describe how thankful I am!! I just rented the indicator and I will update my review after the trades I make. As of now, everything looks good and promising. High chances of riding trends with high reward value. I alsoI like seeing the market trends on 28 pairs and the ease to change charts. A 5 star for me. Moving Average and Currency Strength Line can now have different periods. Moving Average Shift is added for Moving Average Line. Minimal change just on comment section when user's mt4 have missing data.